Announcement: July 4th Night Ride! BikeCommuters.com > advocacy > Announcement: July 4th Night Ride! The Seminole Heights Bicycle Club and Bikecommuters.com are hosting a night ride on July 4th. 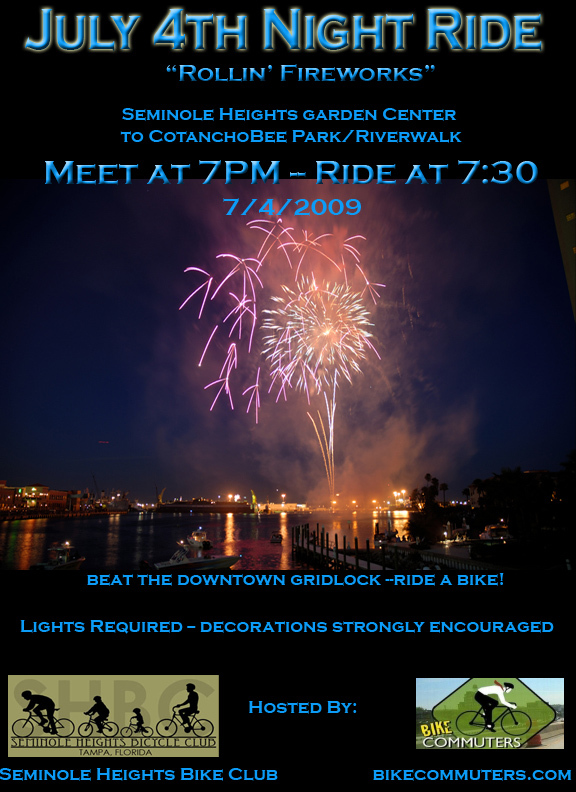 Come ride with us to catch the fireworks display at Channelside in downtown Tampa. We’ll be meeting at the Seminole Heights Garden Center (5800 N. Central Avenue, Tampa) at 7PM and rolling at 7:30PM. Our destination is Cotanchobee Park on Tampa’s Riverwalk. It’s about a 12 mile roundtrip and will be slow-paced, family-friendly and FUN! Bike lights (front and rear) are required and festive decorations strongly encouraged. For details on the route, questions or more information, please contact Jack at: ghostrider(at)Bikecommuters(dot)com. See you there! Click here for a larger version of the flyer. It’s a cool idea to ride around looking at fireworks, but there’s just too much temptation out there for my taste. Maybe in numbers it would work better. What better way to practice bike-handling skills than by dodging explosives? That sounds like fun! Wish I could attend…..I think my non-cycling fiancee would even go for that too, but I live in Indiana. That sure beats driving a car and trying to find a place to park! I wonder if there is an extreme explosive dodging sport out there for cyclists…..